Italian Fourteenth Century Art in Florence and Siena. NOTE: For a general guide to the Italian Renaissance, see: Renaissance Art. (Arena) Chapel (1303-10) in Padua. The trecento is the point in the history of art when the historian settles himself comfortably in his chair, projects his mind to Assisi somewhere about the year 1290 when Giotto, aged twenty-three, is busy on the frescoes in the Church of St Francis. The historian can now relax: Proto-Renaissance art has begun and the Renaissance proper is within sight. From 1290 till the present day the course of European painting is clear. Hardly a decade will pass without some famous name to fill it, some masterpiece familiar to a million readers. In 1290 the foundations of modern art were being sketched out and the shape of the whole structure was becoming inevitable, and, what is more to the point for the art historian, describable. There is a full vocabulary ready at hand and the story has been written a thousand times. Note: for details of painting from the Italian Renaissance proper, see: Early Renaissance Art (c.1400-90), followed by High Renaissance Art (c.1490-1530). For information about marble, bronze and wood carving, see: Italian Renaissance Sculpture (c.1250-1530). It starts, unlike the story of every other art-cycle, with a giant. Giotto did for Florentine painting what Myron did for Greek sculpture. But he did it at the very beginning, instead of profiting by a century of experiment. He suddenly saw life in the round. Painting, after 1300, needed no longer to be an exercise in two-dimensional design; it could be an adequate representation of objects in space, objects that possessed not only shape and colour but weight and volume. Doubtless, the eyesight of the sculptor who carved the archaic boys and girls of the Acropolis was not unlike that of Praxiteles, and the eyesight of Giotto must have resembled that of Rembrandt. Looking at the same object, all four would presumably have much the same image on the retina. Why then does the first pair produce entirely different statues and the second pair entirely different pictures? How is the stylistic difference between Greek sculpture of the seventh century BCE and of the fourth century BCE to be explained? Assuming that the archaic Greek sculptor is doing his best to fashion a stone image of a naked man exactly as his eyes see him (and the supposition seems reasonable in view of the later developments of Greek art), how can we account for the fact that any given statue of the period bears a much closer resemblance to any other statue of the same period than either of them does to the object represented? Why cannot sculptor B, noting the stiffness and immobility of sculptor A's attempt to carve a male athlete, and the system of frontality from which A seems unable to escape, immediately carve a statue that has none of these 'defects', using his eyes to observe and his chisel to carve exactly what he sees? The answer appears to be that the eye is, as it were, one end of a complicated passage, at the other end of which the brain stands on guard, refusing to admit anything with which it is not already familiar. The eye admits the whole visible world in a chaotic torrent of undigested visual information. But before the artist can deal with the information so admitted it must be sorted out. Now at any given moment in the development of vision, only certain limited quantities or aspects of that information are acceptable. What is acceptable at once becomes the artist's visual raw material, what is not is unusable and is therefore automatically rejected. It is useless for him to intellectualize the problem and to tell himself that the whole visible world in all its aspects is at his disposal. The sentry in his brain stands on guard in spite of him. In Leonardo's notebooks are analyses of the nature and colour of light which, if he could have acted upon them, would have led to his painting with the palette of the nineteenth-century Impressionists. But Leonardo, giant though he was, could not visualize the conclusions to which his intellect had led him. He could see exactly what Monet and Pisarro saw, and he could think clearly enough to anticipate the nineteenth century, but the invisible sentry in his brain would admit nothing into his visual experience that was not already part of the common visual experience of the late fifteenth century. His vision would not travel at the same speed as his thought. Period-vision can develop only by gradually persuading the unseen sentry that such and such aspects of what the eye has let through are respectable and trustworthy. They must arrive with proper credentials, and the highest credential they can have is that they have been used already by other artists and have passed into the accredited currency of art. To admit anything that is not part of contemporary currency is to take grave risks, and it is the mark of the adventurous spirit in art to be prepared to take such risks. Most artists will take infinitesimally small risks of this kind, and then only under the influence of a strong aesthetic emotion that positively beats down the sentry's defences. In the whole history of art there is no painter who has taken more of these risks than Giotto, none who was less dependent on the artistic formulas of his time, none who made possible so long a stride forward in period-vision. For that reason he is one of the art-historian's most cherished figures, for he makes an unmistakable starting-point for a new epoch in art-history. Florentine painting starts, like a sprint, with a pistol shot. In 1280 it hardly exists. By 1300 it is racing ahead. In fact it is racing ahead altogether too fast. Usually when a great artist has the audacity to admit a new set of visual experiences and embody them in his art, his followers are only too ready to profit by his daring. Within a few years his discoveries are already part of the tradition of his time. But here was a man who had gone too far ahead for his followers to catch him up. Or perhaps he arrived on the scene too early. The pistol shot went off, as it were, before the other runners knew that a race was in progress. After all art at the end of the thirteenth century in Italy was still based on Byzantine art - or at least a Byzantine formula. Not only were the permissible subjects for Christian iconography carefully tabulated, but so were their order of precedence, the manner of their presentation, and even the colours to be used. Giotto, in breaking all these rules, was not quite alone, though he was alone in the world of painting. It was St Francis who made the first attempt to break the chains by which medieval Christian dogma had deliberately fettered itself. St Francis in humanizing religion doubtless gave Giotto the courage to humanize religious art. These two innovations, the new capacity to see life in the round, and the new desire to infuse warmth into the Byzantine conception of religion, were opposite sides of the same medal. Giotto could conceivably have introduced either into his painting without the other, and either taken by itself would have made him an important figure. But his power to combine the two made him gigantic. His command of the three-dimensional world was a by-product of his humanity and, in particular, of his sense of human drama. He regarded himself as a narrative painter. His concern was to tell his story by establishing the emotional relationship between the persons depicted in his fresco painting. Every figure in Giotto's oeuvre is, so to speak, an agent of the emotion, a vessel specially created to contain it, so that however 'badly drawn' (according to academic standards) it may be, it is still performing its complete function. One has the same feeling in reading Shakespeare. Psychologically his characters are so intensely and completely realized that the arbitrary and often absurd behaviour they indulge in passes unnoticed. Dickens too, in his smaller way, can persuade his readers that a character like Micawber, based on a purely artificial formula, is really a flesh and blood creature abounding in life. Giotto never failed to produce this effect, not only in his individual figures but in his groups of figures. With the period-vision at his disposal, and notwithstanding the new material he added to it, he could not possibly have the grasp of the visual world that came so easily to a Tintoretto or a Rembrandt. Yet in spite of these limitations one can walk all round his figures, one can gauge their distance from the eye, feel their weight on the ground, sense the solidity of the limbs under the draperies. Nor does this apply only to his figures. Their settings too have something of the same reality. The hills, trees, houses, and meadows among which they find themselves are equally convincing. When one adds to this Shakespearean completeness which makes everything credible, a Shakespearean profundity which makes everything deeply moving, one can take something of the measure of this extraordinary painter. He sowed so many and such various seeds that there is hardly any aspect of art during the next few centuries that is not traceable to him, and though in any given direction he was destined to be outstripped by later men, no other painter ever held quite so many trump cards at once. Fra Angelico (c.1400-55) developed his sweetness, Masaccio (1401-1428) his sense of drama, Raphael (1483-1520), his balance, Michelangelo (1475-1564) his sense of gesture, Piero della Francesca (1420-92) his sense of space, many later painters made use of his feeling for landscape, but in none of them were all these gifts combined. To study the Christian art in the Arena chapel at Padua is to realize that a new era has been born, capable of growth in any number of different directions; that here is the starting-point for a new set of adventures and that Giotto provided signposts for them all. It has not been given to many men to achieve a revolution single-handed. It is no exaggeration to say that Giotto did so. He was born in the late 1260s and died on 8 January 1337. What is known about his early training and his movements is fragmentary. The authenticity of many of the frescoes usually ascribed to him is doubtful. Yet he left behind him a body of work that establishes him as both one of the world's best artists of all time and one of the world's most courageous innovators. It is important to distinguish between the two. Genius can either be conservative and refine or perfect an existing tradition, or it can be revolutionary and suddenly create a new one. Raphael is an outstanding example of the first kind of artist, Giotto of the second. Both kinds are equally precious and equally necessary if we regard the artist as a creator of masterpieces. If, on the other hand, we think of him as a man who not only expresses the spirit of his age but also helps to shape it, then the innovators must be acknowledged as having given to the world a more valuable legacy than the traditionalists. It is a legacy that is difficult to explain. We can follow the workings of Raphael's mind as he forged those miracles of perfection that mark the climax of High Renaissance painting. But we cannot so easily account for Giotto. He was born into a world whose art was hieratic or symbolic, whose craftsmanship was magnificent, but whose vision was rigidly confined between the fanciful and vital but conservative Gothic art of the North and the impressive but even more conservative Christian Byzantine art of the East. He left behind him an artistic vision that was concerned with human beings. He altered the focus of the human mind, tore down the veil which for centuries had hung between man's soul and his body, and revealed the new set of possibilities which were to be explored by painters and sculptors for centuries to come. Each event he describes in his narrative frescoes at Assisi, Padua, and Florence is an event that manifestly takes place in a given environment on the surface of the planet on which we all live, and the personages who take part in the event are men and women whom we recognize as belonging to the human family. They move, speak, breathe: we know from their attitudes and their gestures that they are subject to the same hopes, fears, loves, hatreds, sorrows as ourselves. This had never happened before in the history of art. To marvel at Giotto for introducing this new focus is one thing: to estimate his worth as a creator of pictorial masterpieces is another. He could have been the first humanist and yet have been a mediocre artist. It happened that he was not. He was outstanding both as an innovator and as a creator. Other Proto-Renaissance artists accepted his innovations, realized their importance, and pursued the path he had indicated; yet many of them were mediocrities. Giotto dominates the fourteenth century as far as Tuscan art is concerned. His message, new though it was, was not misunderstood. On the contrary, his Florentine contemporaries and his immediate successors found it so attractive that they could do no more than repeat it, parrot-like, and in the repetition it became a little stale and arid. For that reason there is no need to describe them. They are many, and their names are known: Taddeo Gaddi (c.1296-1366), Bernardo Daddi (c.1290-1348), Masolino (1383-1440), Giovanni da Milano among many others. The followers of Giotto are not lacking in charm or technical ability. They produced, for example, that enchanting interior, the Spanish Chapel at Santa Maria Novella in Florence. Yet, if it had never been painted, the course of Renaissance art would hardly have changed, whereas without the frescoes in the Scrovegni Chapel (also called the Arena Chapel) one wonders how Early Renaissance painting could have got into its stride at all. A new style cannot be invented. Giotto, so tradition has it, was the pupil of Cimabue (Cenni di Peppi) (1240-1302). And Cimabue himself, shadowy though he is, was evidently something of an innovator despite his Byzantinism. Yet Giotto was in Rome in 1298, and in Rome he must have absorbed the more plastic Roman tradition of painting as practised there by his contemporary, Pietro Cavallini (1270-1330). This is not the place to discuss influences, but influences there must have been. Bricks are not created without straw, though there is no space here to analyse the nature of the straw Giotto used. Three sets of frescoes sum up his achievement. The St Francis cycle in the Church of St Francis at Assisi is justly popular, largely because it seems so appropriate that the first humanizer of Christianity should be portrayed by the first humanizer of painting. The Scrovegni Chapel frescoes at Padua are in every way finer. 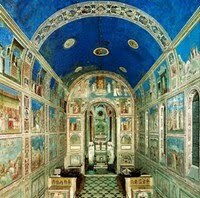 Moreover, when Enrico Scrovegni built the chapel in 1305 on the site of a Roman arena, he intended its interior to be painted by Giotto. Architecture is here subservient to painting and Giotto had a completely free hand. It is here, in the thirty-eight scenes from the lives of Christ and the Virgin Mary, that his immense dramatic power is most fully manifest. Every gesture is significant, every glance has a meaning. Nothing is redundant, nothing is overstated, nothing is introduced merely for its decorative effect. Joachim's slow, shamefaced stride, the puzzled, questioning looks of the shepherds that intercept each other at his approach, the welcoming dog, the stage scenery that suggests exactly the kind of environment required and contains the action without disturbing it: the awful moment captured in The Betrayal of Christ (Kiss of Judas) (1305) when Christ and Judas, incarnations of Good and Evil, regard each other face to face, alone in the midst of an agitated crowd of men and spears: the grief-stricken Virgin in the fresco The Lamentation of Christ (1305), gazing into the dead face of her Son, taken down from the Cross, framed by those two impassive back views of seated women, as simple and immovable as boulders, while the drapery of the woman who stands over Mary descends in a waterfall of vertical folds that carries the eye down with it: the fluttering, hysterical angels that fill the sky overhead with lamentation - all this is Shakespearean in its strength and intensity. And throughout the whole series, the grouping of the protagonists in the centre of the stage and of the minor characters at the sides, the nobility and expressiveness of the gestures, the simplicity and effectiveness of the scenery would strike any producer of stage plays as the ideal solution of the difficult problem of how most effectively to convey the dramatic content of each given scene. The chapel was finished in the early years of the fourteenth century. It is said that while Giotto was working there, Dante, passing through Padua, visited him. The meeting strikes us today as strangely significant. The last and greatest of the medieval poets must have been impressed by the vivid narrations of the lives of Jesus and Mary on earth. Indeed, Dante has recorded that he considered Giotto had eclipsed Cimabue. Yet he must also have been a little puzzled by the solidity and the earthiness of Giotto's characters. A comparatively barren period for Florentine painting followed Giotto's death, but that same period was by no means barren in Siena. Indeed there were moments during the course of the fourteenth century when it looked as though Siena and not Florence was going to decide the future of European painting. It would be silly to exaggerate the difference in spirit between the two cities. Historians have been tempted to say that Florence looked forward to the Renaissance while Siena remained medieval at heart. There is a grain of truth in this. The two cities are different and their art is different, but the difference is not so much between two conceptions of life as between two conceptions of art. There is more than a suspicion of "art for art's sake" in Sienese painting. In Giotto there is none. In the struggle between truth and beauty which underlies all art, (see aesthetics) beauty is inclined to get the upper hand in Siena, truth in Florence. If the Sienese School of painting clings to the Byzantine tradition it is not through conservatism but through intellectual laziness. What the Sienese have to express has nothing to do with Byzantium, but here is a serviceable set of idioms to hand, so why not use them? Nothing in the Sienese spirit has made them obsolete. Florence throws them overboard without hesitation or regret, Siena adapts them to her needs. Occasionally a particularly intense emotional conception, like the angel seated on the tomb in Duccio's panel of the 'Three Marys', or the shrinking Madonna in Simone's 'Annunciation', seems to demand a new set of shapes, a complete departure from tradition. Giotto would have gone straight to nature in such cases. Not so the Sienese artists. They produced the new shapes by a sheer effort of invention. They had a sense of rhythm which could, when necessary, dispense with a sense of actuality. When that sense failed them the result was mere affectation. When it did not they reach imaginative heights attained by no other school of painting. As for the kind of life depicted in their narrative painting, it is an altogether more delicate, aristocratic affair than in Florence. The Sienese seem to have richer furniture in their houses, finer needlework on their brocaded dresses, gayer patterns on their tiled floors. Lorenzetti's Nativity of the Virgin in Siena, gives the impression of a family that had spared no expense when setting up house, still more so Sassetta's picture of the same subject at Asciano. But the Sienese school had none of the stamina of Florence. It could see life in the round, but it could not set that life firmly on the earth's surface. Sienese figures may be round but they are not solid. They are no longer cardboard like Byzantine figures: they have the three-dimensional existence of a balloon but not the weight of a boulder. Sassetta (Stefano di Giovanni) (c.1395-1450), the last of the great Sienese painters, could paint the betrothal of St Francis to his three mystical maidens, who immediately and without giving the spectator the faintest spasm of surprise float gaily away through the air. If Giotto had tackled the subject one would unconsciously look for the mechanism that enabled them to perform this charming act of levitation. In the end the more robust art of Florence was bound to win. Sienese art enjoyed its moment of exquisiteness and then succumbed to Florence. Note: Much of the early attribution of paintings from the trecento was done by the art historian Bernard Berenson (1865-1959), who lived most of his life near Florence, and published a number of highly influential works on the Italian Renaissance, including the Siena school. Even allowing for the inevitable stylistic difference between large areas of wall covered with fresco and comparatively small tempera paintings on panel, it is quite evident that Giotto and Duccio are very different personalities and that the schools of painting they' founded are different in character. It would be an exaggeration to suggest that the temperamental difference that undoubtedly existed between the two cities of Siena and Florence accounts for the difference between the two artists, but it would certainly be almost true to say that all that we think of as typical of Sienese art - the refinement, the delicacy, the aristocracy, the conservatism, and the charm - can be traced to Duccio, while the robust humanity, the virility, the drama, the intelligence that are characteristic of Giotto are, with slight variations and exceptions, expressions of a Florentine point of view. The traveller in Italy today who makes the journey from Florence to Siena is not merely covering sixty miles of Tuscan soil. He is exchanging a city of philosophers and intellectuals for a city of poets and mystics. The spirit of the Middle Ages still clings about Siena, and although the paintings produced by Duccio and his successors (including Lorenzo Monaco 1370-1425, the Siena-born International Gothic painter) are certainly not medieval, what differentiates them from the paintings of an earlier century is not the brave, robust curiosity that was to be so characteristic of Renaissance man but a self-conscious pursuit of refinement and beauty. When in certain works by Sienese painters of the fourteenth century we seem to find beauty itself in isolation, we realize how necessary to the full development of Italian painting was the Sienese contribution. By itself it achieved much that is precious, but only when it became incorporated, as eventually happened, into the mainstream of Florentine art did the Tuscan artist of the fifteenth century find it possible to exercise his full power as philosopher-poet. There is a strain of Sienese refinement in Fra Angelico (c.1400-55), in Botticelli (1445-1510), and in Perugino (1450-1523): there is none in Masaccio (1401-1428) and Michelangelo (1475-1564). Perhaps the greatest manifestations of genius can afford to dispense with sweetness, yet without sweetness the flavour of Italian painting would be incomplete. But the Sienese painters of the fourteenth century had more than sweetness. 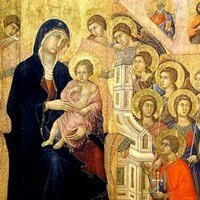 The orderly, hieratic gravity of the Madonna and her attendants in Duccio's Maesta owes much to the power of the Byzantine tradition - perfected in its icon painting - which lingered on in Siena long after it had been ousted from Florence. And in the narrative panels on its reverse side one finds in addition touches of poetry based on the most sensitive kind of observation of human behaviour. In Duccio, Byzantine formalism seems to be breaking down. The Christ of the Noli Me Tangere is clothed in formalized Byzantine drapery but his gesture has a tenderness that is even more expressive, even more studied, than one finds in Giotto. The maidservant who pauses at the foot of the stair to listen to Peter's denial and the unforgettable gesture of the angel seated by the empty tomb are creations of poetic genius rather than of dramatic imagination. Giotto could never have discovered the purely linear rhythms that inspired Duccio at these moments. Nor could he have imagined the shrinking Madonna of the Annunciation by Simone Martini, born a decade later than Duccio, nor the breathless reverence of the angel Gabriel, nor the clear-cut, fashionable elegance of the wreath in his hair, nor the attenuated pathos of the outline of Lorenzetti's dead Christ in the Deposition fresco at Assisi, nor the lovely line rising like the curve of a breaking wave that encloses the group gathered round him. In the exquisite painting of Simone Martini there is less Byzantine art and more Gothic than in Duccio's. See, for example, his greatest masterpiece, the Annunciation Triptych (1333) now in the Uffizi. Such a generalization is easy to make and it is certainly true, yet its importance should not be exaggerated. During the fourteenth century the cities of Northern Italy were crossroads where cultural currents met and intersected. Siena was particularly sensitive to the Byzantine influence brought from the East by craftsmen, Crusaders, and merchants, and to the French culture that flowed southwards across the Alps and northwards from Naples. Duccio was more influenced by the former, Simone by the latter, yet, in a brief survey of the whole course of European painting, the difference between the two is less remarkable than the similarity. The Gothic and Byzantine flavours are in both cases subsidiary to the dominant Sienese flavour. That flavour is strong in Duccio, stronger in Simone, and is immediately recognizable in Pietro Lorenzetti (active 1320-45) and his brother Ambrogio Lorenzetti (Active 1319-48). See, for instance, Ambrogio's Allegory of Good and Bad Government (1338-9, Palazzo Pubblico, Siena). It continues throughout the fourteenth and persists into the first half of the fifteenth century, where, despite its poetic charm, it begins to look a little old-fashioned, as though an island home of a family of aristocrats and exquisites were being invaded by the rising tide of Renaissance democracy. Finally it disappeared, but not without leaving behind it, in the very heart of Tuscany itself, memories of a fairy tale. Sassetta's Birth of the Virgin at Asciano is one of the last full statements of the Sienese spirit. No Florentine household, one feels, could have been as tastefully furnished as this or as sophisticated in its conduct. Sienese painters were also known for their Medieval manuscript illumination, and the followers of Simone Martini as well as painters like Lorenzo Monaco (1370-1425) produced numerous International Gothic illuminations, largely modelled on French and Byzantine models. Pre-Renaissance paintings from fourteenth century Florence and Siena can be seen in many of the best art museums around the world.  For the meaning of important 14th century pictures, see: Famous Paintings Analyzed.  For information about Renaissance painting and sculpture, see: Homepage.